Brittany Tutterow and her one-year-old daughter were not home around 1 p.m. Wednesday. She was at work -- watching it all unfold through her CPI security app. 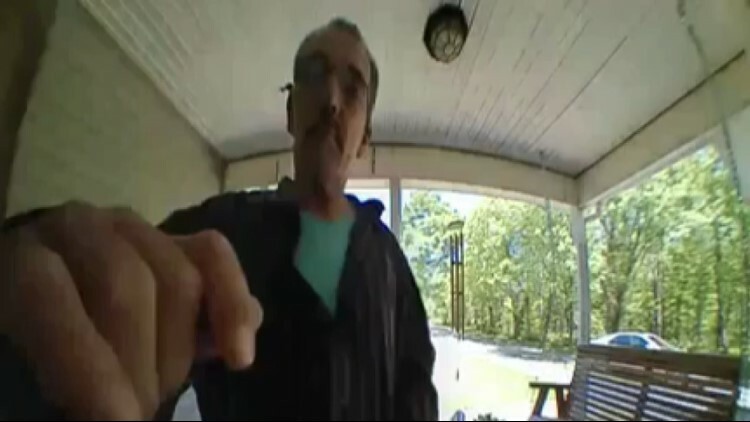 ROWAN COUNTY, N.C. -- A mother watched a man try to break into her home in real time on her smartphone in Rowan County. “My phone goes off. Someone’s ringing my doorbell. I have no idea who this guy is,” Brittany Tutterow said. Tutterow and her one-year-old daughter were not home around 1 p.m. Wednesday. She was at work -- watching it all unfold through her CPI security app. “I can tell he’s using his sleeve to cover up his fingerprint whenever he mashes on the doorbell,” she explained. The guy started to knock then broke her door handle. “It then goes off that I have a glass break detection,” said Tutterow. The alarm sounded, and the man hopped in his car and drove off. The whole thing lasted three minutes. The sheriff’s office describes the suspect as mid to late 30s with glasses and thick mustache. “I’d kill somebody if they came in here,” Tutterow warned the man and anyone else who tried breaking into her family’s house. If you have any information about this incident, call Lt. Chad Moose at 704-216-8687 or Crime Stoppers 866-639-5245. If you're interested in obtaining a CPI Security system for your home, click here.